Helmer Philip Kaufman's Invasion of the Body Snatchers is the epitome of a movie remake done right. Made twenty-two years later to tap right into issues of conformity and expanding roles for women in both the workplace and at home even more so than the 1956 subversive original, Invasion of the Body Snatchers is at once intelligent, gleefully paranoid, fast paced in both action and plot revelations, and filled with characters who seem both logical and relatable. More chillingly scary than terrifyingly scream inducing, the movie allows the fear to build steadily as though we're on a rollercoaster approaching the top of a very high first hill before Kaufman just lets us go flying through the park on adrenaline. Within the first act, we join forces with brainy government employee and wife Elizabeth Driscoll (Brooke Adams) whose self-absorbed, frankly obnoxious husband turns into a lifeless automaton seemingly overnight. While investigating his strange behavior alongside her health inspector colleague Matthew Bennell (Donald Sutherland), the two realize that what happened to Elizabeth's husband is only the beginning. Somehow, a unique floral plant from outerspace has begun growing pods, transforming loved ones into strangers who then band together with people they'd previously never met to further the invading takeover of the “body snatchers” in California. The cinematic result is a far more sophisticated and fortunately less gruesomely gory '70s genre picture than audiences were most likely expecting, undoubtedly also fooled by preconceptions about the purported lack of originality given the fact that it was a remake, only to discover that Kaufman knew exactly which parts to pay homage and what to adjust. 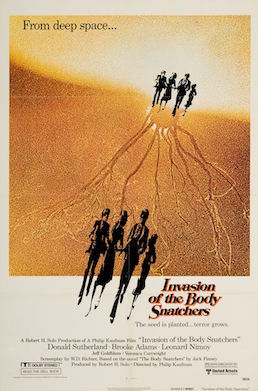 Invasion, which co-starred Jeff Goldblum, capitalized on both the tongue-in-cheek “me decade” culture as well as the huge box office successes of other scary movies that had been released over the period of those ten years from high caliber Oscar bait like The Exorcist to the independent smash Halloween that gave birth to the new breed of slasher movie. Subtly scary and much more realistic in its approach of extraterrestrial danger than we're usually offered in the genre, Fox's slightly grainy and dark yet aurally spectacular high definition upgrade of the thrilling contemporary horror classic makes an ideal addition to an impromptu spooktacular do-it-yourself Halloween film festival at home.